There continues to be a significant lack of diversity among physicians in the United States. Despite well-documented advantages associated with having a diverse physician workforce and efforts to recruit underrepresented students into medical schools, little has changed over the past two decades. As medical students at the University of Michigan, the three of us have been fortunate to be involved in an amazing program called Doctors of Tomorrow (DoT) for the past four years.  DoT was founded in 2012 by Dr. Jonathan Finks, Associate Professor in the Department of Surgery at Michigan Medicine. It is a partnership between the University of Michigan Medical School and Cass Technical High School in Detroit, created to inspire and prepare high school students who are underrepresented in medicine to pursue careers in the health fields. DoT has grown significantly over the years and now provides support for students starting in ninth grade continuing all the way through matriculation into medical school or other health professional schools. While DoT and similar programs across the country may have found success within their local communities, it is clear that if there is ever going to be significant change, there must be a national, coordinated effort to address the lack of diversity in medicine. Recognizing this need, we decided to put on the first-ever Diversity in Medicine Conference at the University of Michigan, hosted by the DoT program. Diversity in Medicine Conference speakers. 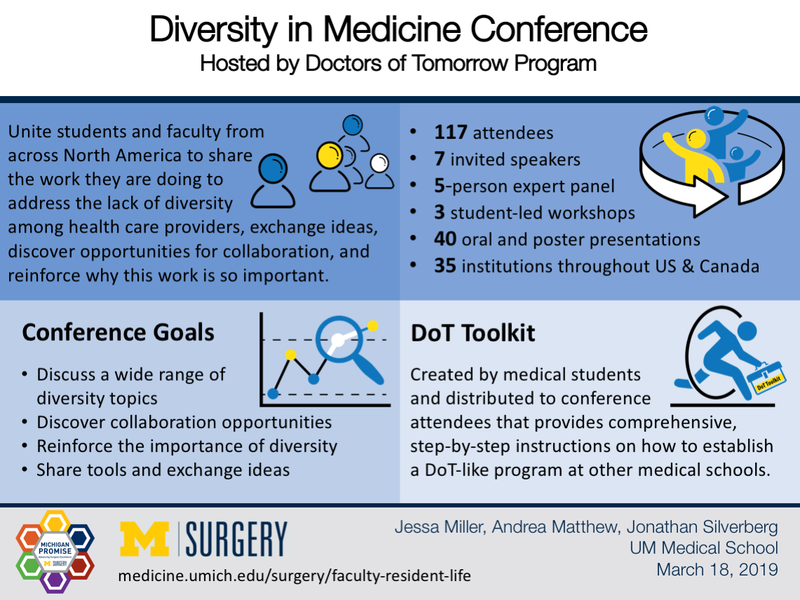 The Diversity in Medicine Conference took place February 8th-10th, 2019 in Ann Arbor, MI. The purpose of the conference was to unite students and faculty from across North America to share the work they are doing to address the lack of diversity among health care providers, exchange ideas, discover opportunities for collaboration, and reinforce why this work is so important. A total of 117 individuals attended the conference, representing approximately 35 different institutions throughout the United States and Canada. There were talks given by seven invited speakers, a five-person expert panel, and three student-led workshops that focused on race and ethnicity, gender bias, and disability. Furthermore, there were more than 40 oral and poster presentations given at this conference, covering a wide variety of topics that ranged from wearing hijabs in the operating room to a diversity liaison program for faculty recruitment and hiring. We applied for and were fortunate to receive multiple grants, which funded nearly every aspect of the conference. In order to make the event as accessible as possible, there was no conference registration fee. Additionally, partial funding for travel and lodging expenses was provided to all presenters who applied for financial assistance. On the final day of the Diversity in Medicine Conference, Dr. Jonathan Finks gave a presentation about the DoT program and its evolution over the years. Two current undergraduate students at the University of Michigan who are alumni of Cass Technical High School and DoT gave a presentation about their experiences with the program and how it has positively impacted their journeys. At the end of the day, the “DoT Toolkit” was distributed to conference attendees. This is a document created by medical students that provides comprehensive, step-by-step instructions on how to establish a DoT-like program at other medical schools that are looking to increase their diversity efforts. What metrics are being used to track progress? At the conclusion of the conference, a brief online, anonymous survey was e-mailed to conference attendees to determine what the most valuable aspects of the conference were, gauge the conference’s effectiveness, and understand how the conference can be improved in the future. Of the 117 individuals who attended the conference, 38 responded to the survey (32.5% response rate). Preliminary analysis of the survey data demonstrates that the conference was successful in providing individuals with a space to share and discuss initiatives aimed at increasing diversity in health care. When asked about their familiarity with efforts to increase the number of underrepresented minorities in health care fields, prior to the conference, 34.4% of individuals were extremely familiar, 25% were moderately familiar, 37.5% were slightly familiar, and 3.1% were not familiar at all. After the conference, in response to this same question, 62.5% were extremely familiar, 34.4% were moderately familiar, 3.1% were slightly familiar, and 0% were not at all familiar. Additionally, after attending the conference, 83.9% of attendees were moderately or extremely confident that they could start an initiative aimed at increasing diversity in the health care fields. We will use the survey results to improve the conference for next year, and we plan to continue sending out a post-conference survey to attendees in subsequent years to track longitudinal progress. Scenes from the Diversity in Medicine Conference. What did we learn? What were the challenges? Planning and executing this event as medical students with no prior experience organizing conferences made the entire process an endless learning opportunity. We learned a great deal about the logistics of planning such a large-scale event, from the timeline of submissions and registration to speaker recruitment to last-minute catering modifications. Learning how to be flexible was likely the most important skill we practiced, along with the importance of maintaining constant communication among the planning team to make sure everyone was on the same page. We also developed a better understanding of what goes into creating a space where effective dialogue can take place. Thankfully, our attendees were passionate about the mission of the conference and it was less challenging than expected to facilitate conversations surrounding the topics at hand. That said, we still tried to be intentional about encouraging everyone to be open and honest in their interactions throughout the weekend, providing an environment where everyone could learn from one another. Most of all, we discovered that there are passionate students and faculty across the United States and Canada who are doing incredible things to help increase diversity in the health fields. The Diversity in Medicine Conference seemed to provide a useful opportunity for these individuals to connect, collaborate, and begin to pave the way forward together. 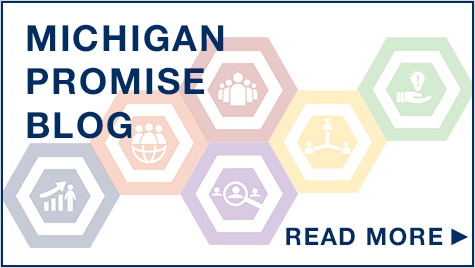 We envision that DoT will continue to host this conference at the University of Michigan for years to come, and we hope to see you there next year!